Geo-fencing can be looked upon as a virtual perimeter that you can draw around any location on a map. If you enter this location, you will receive notifications that your vehicle has entered the specified area. 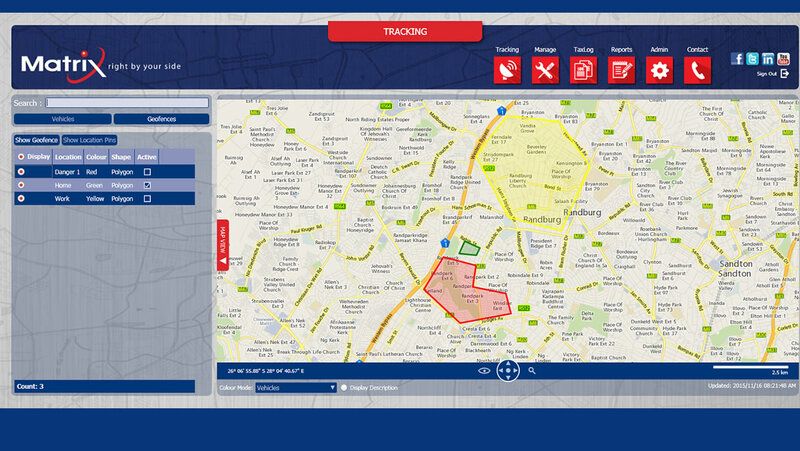 Matrix has created a vehicle tracking management system that allows you to quickly and easily create virtual geo-fences and customizable zones using the latest GPS pinpoint technology. Identify and draw your own virtual geo-fence around your selected zones of importance by using the Matrix Internet Online Tracking application. Create a geo-fence around your neighborhood so that you receive alerts when you or your loved ones’ vehicle enters the zone you have specified. You can also create a geo-fence around dangerous areas that you wish to avoid. Recent police statistics reveal that car hijackings have increased by 14,3% in South Africa since 2015 and a number of these incidents are due to motorists getting lost in dangerous areas and becoming an easy target. If you have a busy family that you would like to ensure stays safe, Matrix’s customizable zone management system allows you to set up geo-fence zones with corresponding alerts for when your family members enter the targeted zone. You can track and manage the safety of your vehicle and your loved ones. Daily, the app monitors each specific geo-fence as it continues to track that location in the background. With Matrix right by your side, geo-fence zone management comes with powerful features that arm you with critical information. You now have the power to be more proactive about yours and your loves ones’ safety on the roads.